boundaries and deconstructing traditional techniques to produce contemporary interpretations that redefine the future of music. Bringing the magic of this inherently evolutionary and experimental genre, Teamwork Arts’ Jazz India Circuit is back with the 2018-19 season. The Jazz India Circuit (JIC) is like a modern-day speakeasy, giving music-lovers and jazz aficionados the freedom to dream and live their music the way they want to. The circuit is also a fantastic platform for both young talent from India and world-renowned legends with scintillating performances strewn across the past decade. The Jazz India Circuit International Festival Goa is an experimental, up-tempo, funky celebration of jazz juxtaposed with diverse genres like punk, funk hip-hop, R&B and other forms of music. 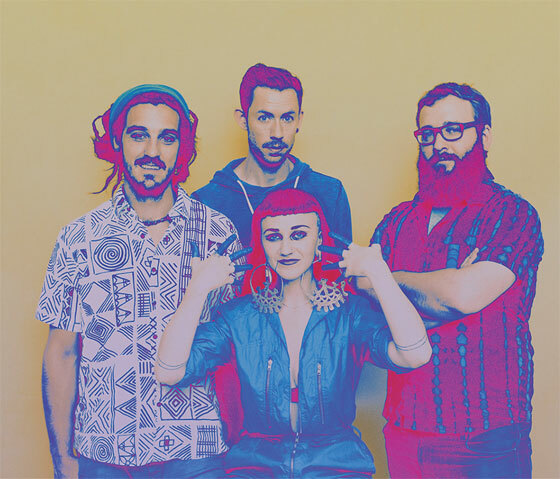 On their maiden tour in India, two-time Grammy-nominated Australian soul quartet Hiatus Kaiyote are set to headline the JIC International Festival Goa along with Indian and international jazz powerhouses like keyboardist Jerome Klein from Luxembourg, Goan drumming legend Lester Godinho, one of Europe’s most exciting jazz groups OZMA, Indian guitar prodigy Rhythm Shaw and his band Orjazzmic, French Afrofunk ensemble Supergombo and finally WorldService Project, leading specialists of British ‘punk-jazz’ and arguably one of the finest and most exported live acts in Europe. is a two-time Grammy-nominated future soul quartet formed in Melbourne in 2011 with Naomi “Nai Palm Saalfield” (on vocals, guitar), Paul Bender (on bass), Simon Mavin (on keyboards) and Perrin Moss (on drums, percussion). was drawn towards the freedom of improvisation and jazz. He devoted himself to drums, vibraphone and piano. the Still Waters lead, began his rendezvous with music at the age of six, studying violin up to Grade 8, before switching to drums. Lester’s passion for music has covered diverse genres encompassing pop, rock, funk, Latin, gospel, jazz, fusion, Western/Indian classical, opera, Bollywood and even hip-hop! is a creative, joyous and adventurous mix, risky and captivating. The 15-year-old quintet has one foot in the liberty of jazz, the other in electro’s trance and both hands covered in greasy rock. It features Edouard Séro-Guillaume on bass and composition, Stéphane Scharlé on drums and composition, Julien Soro on saxophones, Guillaume Nuss on the trombone and Tam de Villiers on guitar. is widely regarded as the best guitarist in the country. Rhythm is the guitarist for Ameet Trivedi’s band and occasionally for A R Rahman’s too. Shaw performs at Jazz India Circuit with his band Orjazzmic. is an exciting new offshoot of a cultural blend from France. Their Afrofunk sound probably comes from the Tout Puissant Orchestre Poly-Rythmo and the Headhunters, blended with influences such as Senegalese Mbalax, Congolese Soukous, funk and jazz. Their seven musicians borrow influences from genres, styles, even neighbourhoods such as la Guillotière, a lively Lyon neighbourhood known for its own cultural mix. the leading specialists of Brit ‘punk-jazz’, are one of the most exported live acts in their field. Their energetic live shows have taken them to festivals across the world. The Jazz India Circuit International Festival Goa will take place at the International Centre Goa (ICG), Dona Paula on December 1 and 2, 2018. Further details and tickets available at jazzindiacircuit.com.